Restriction endonucleases, also called restriction enzymes, cut (“digest”) DNA at specific sequences of bases. The restriction enzymes are named for the prokaryotic organism from which they were isolated. For example, the restriction endonuclease EcoRI (pronounced “echo-are-one”) was originally isolated from E. coli giving it the “Eco” part of the name. “RI” indicates the particular version on the E. coli strain (RY13) and the fact that it was the first restriction enzyme isolated from this strain. EcoRI cuts between the G and the A on each strand of DNA, leaving a single stranded DNA overhang (also called a “sticky end”) when the strands separate. Before you can use any restriction enzymes on your PCR product you will have to “clean up” your reaction. This is done to remove the Taq polymerase and any residual dNTPs from the product (if you don’t remove them they will refill any sticky ends generated by the restriction enzyme!). Another reason to clean up your PCR product is to change the buffer to one more suitable for the restriction enzyme reaction. Fortunately cleaning up reactions is simple and efficient (though not inexpensive!) using small spin-columns sold by Qiagen, a company you will hear a lot about in the coming weeks. The spin-columns have a silica-gel membrane in them to remove salt and contaminants. The membrane binds DNA in the presence of salt and DNA can be efficiently recovered from the membrane once the salt is removed. All the necessary binding and wash buffers are sold with the Qiagen spin-columns and they have unusual and uninformative names like "PB" and "P2". The contents of these buffers are proprietary so we don’t know precisely what they contain, but there is some information about them that is included as part of the protocol. This should help you understand the steps and you should think about the instructions rather than blindly follow them. Today you will use the Qiagen “QIAquick” protocol to clean the DNA you generated by PCR. You will then digest the product as well as some purified plasmid, provided by the teaching faculty, to clone into. Remove 5 ul from each of your PCR tubes and move them into full-sized eppendorf tubes. These will be stored in the –20°C freezer to run on an agarose gel next lab. Discard the PCR tube that served as your no template control. Move the remaining volume of your complete PCR sample to a large eppendorf tube and add 5 volumes of PB (e.g. if you moved 50 ul then 5 volumes would be 250 ul). PB is a high salt, low pH buffer added so the DNA in your reactions will bind the silica membrane. The salt in PB is guanidine hydrochloride, a chaotropic salt, meaning it will exclude water from the DNA, effectively precipitating it so it will bind the membrane in step 3. Get a QIAquick column and a collection tube from the teaching faculty then pipet the PCR/PB sample into the top. Microfuge the column in the collection tube for 60 seconds. Remember you must balance your tube in the microfuge so find a group ready to spin with you. Discard the flow-through in the sink and replace the spin-column in the collection tube. Add 750 ul of PE to the top of the column and spin as before. Qiagen sells PE and does not reveal all its contents, but the solution is at least 80% ethanol which keeps the DNA precipitated and on the membrane but washes the salt away. Discard the flow-through in the sink and replace the spin-column in the collection tube. Spin for one more minute. Strange as it seems this is a very important step since it removes any residual ethanol from the membrane in the spin-column. If you forget this step the ethanol will elute with your DNA and will inhibit the upcoming restriction digest. Trim the cap off a new eppendorf tube and label the side with your team color and the date. Place the spin-column in the trimmed eppendorf and add 30 ul of EB to the center of the membrane. EB is one solution we do know everything about. It’s 10 mM Tris pH 8.5. Since the DNA will solubilize at low salt and high pH, it elutes from the column when EB is added. Lab water can also be used to elute the DNA but it’s worth remembering that the pH is likely to be more acidic than 8.5 and so the company recommends eluting with EB when possible. Allow the column to sit at room temperature for one minute and then spin as before. The material that collects in the bottom of the eppendorf tube is your PCR product, ready to be digested. You will be cutting both the PCR product and a version of the pCX-EGFP plasmid that lacks the EGFP gene. 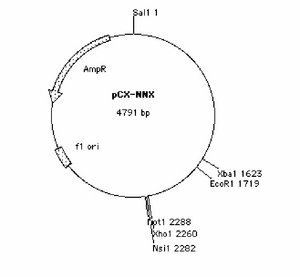 This plasmid, called pCX-NNX, was created from pCX-EGFP in two steps. 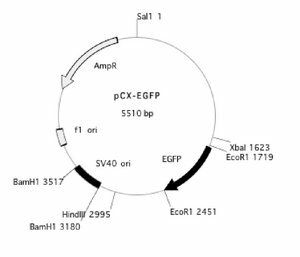 To remove the EGFP gene, pCX-EGFP was digested with EcoRI and the backbone was religated. In a separate step some useful restriction sites were inserted, (Nsi1 at 2282, Not1 at 2288 and Xho at 2260). 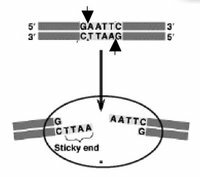 This second step removed the SV40 origin of replication as well as some flanking sequences. ^New England Biolabs sells buffers to use with their enzymes. You will use their buffer called NEB2. It is very important to be thoughtful to your labmates here! Use only clean pipet tips when going into the lab stocks of plasmids and enzymes. Keep the enzyme stocks cold or they will denature and be useless for everyone. Flick your tubes to mix the contents, give them a quick spin in the microfuge if there are droplets stuck in along the wall and incubate the digests at 37°C for the remainder of the lab period. The pCX-NNX digest will be finished almost instantly but PCR products are harder for enzymes to digest and should be allowed to react for at least one hour, in some cases overnight. Before you leave lab today, there are short articles about biological engineering for you to read. Before lab ends, you and your partner will present to the rest of the class the primary idea of the article and your thoughts on it. A two minute synopsis is all that is necessary, although more is fine too. You will also learn about scientific writing, a tour guided by the class writing instructor, Neal Lerner. General guidelines for writing scientific reports can be found on the wiki (http://openwetware.org/wiki/BE.109%3AGuidelines_for_writing_a_lab_report). Look at this if you have time. Draw a plasmid map of the clone you are trying to create. Include all the restriction sites that will be introduced. List the sizes you would predict for the fragments generated by an EcoRV/XbaI double digest and a BamHI/XhoI double digest. Why was the concentrated buffer added to the water before the enzymes? What would you predict if you accidentally used NEB1 instead of NEB2? What about NEB4? Use the following data from the NEB catalog to inform your answer. This page was last edited on 14 February 2006, at 11:08.